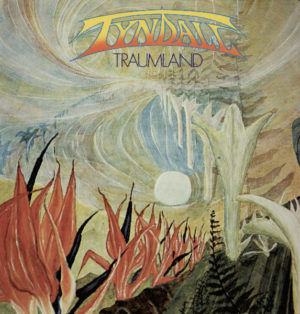 Bureau B present a reissue of Tyndall’s second album Traumland, originally released in 1981 on Sky Records. The electronic sonic inventors Tyndall pulled out all the stops for their second album. Armed with an impressive array of analog synthesizers, they unleashed the full force of their experimentalist ambitions, weaving synth pop, repetitive bass patterns, laminar sounds, and carefree melodies into a unique amalgam of the Düsseldorf and Berlin Schools. Traumland was released a year after their debut effort Sonnenlicht (BB 286CD/LP). As the title (“Dreamland”) suggests, Jürgen Krehan and Rudolf Langer left the earthly realm behind to draw the listener into an almost surreal dream of cheerfully fluting miniatures, as alien as they are imaginative. Traumland is far more experimental than its predecessor, at times even recalling early works of Düsseldorf’s synthesizer-pop exponents of the avant garde, Der Plan. Krehan and Langer shared a passion for creating their own electronic instruments, yet when it came to recording the second album, as on their debut, they supplemented the ones they had built with a considerable amount of purchased equipment. This growing arsenal now included several semi-modular Roland System synthesizers. Roland premiered the System 100 in 1975, acknowledged today as one of the very best sounding analog synthesizers, boasting the trademark Roland timbre. Aficionados tend to prefer the System 100 to its considerably more powerful successor the 100m on account of its warm, vibrant sound, and its excellent playing characteristics. The system was immensely popular with other bands in the electronic field such as Tangerine Dream and Depeche Mode. This massive analog synth armory can clearly be heard on Traumland. On many tracks, filtered basslines condense into a funky foundation of looping miniatures. Juicy drum sounds and strikingly hard synth sequences are coupled with saccharine organ and prancing flute sounds, countered by a noise generator or lost in a maelstrom of experimental echoes.